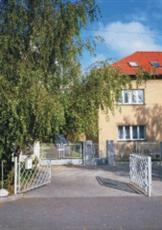 Cheap accommodation in the quiet atmosphere of a family pension (boarding-house) in Prague. The total accommodation capacity is 10 beds. In case of a larger group, arrangements with near accommodation facilities can be made. Parking in a locked garden is safe and included in price. There are chairs and tables at your disposal in the garden. Our range of services: Each room has a private WC and shower. Chairs and tables in a beautiful and quiet garden. Parking in a locked garden - safe and included in price. Breakfast to our guest´s wishes and served in the room. Pleasant family atmosphere and friendly and perfect service.